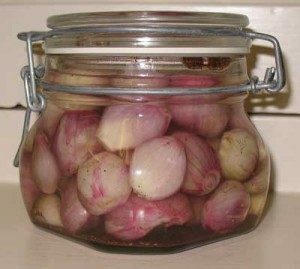 The main thing you need to pickle onions is plenty of time, otherwise it is quite straightforward! The spiced pickling vinegar can be of any flavour & it is worth trying a few different ones. Either buy spiced pickling vinegar, or make your own using a different vinegar (cider, wine, raspberry vinegar etc) & add your own combination of spices. Pre-mixed pickling spices can be found in supermarkets, or you can add your own combination of chillies, ginger, pepper, mustard seeds etc.. 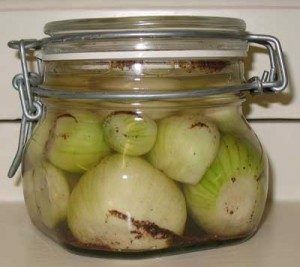 It is very easy to pickle onions, just time consuming! 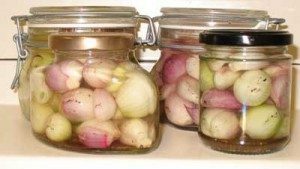 But a jar of home-made pickled onions is a treat – or an excellent gift or Christmas present.